Bees and their products have always been highly valued in medicine and cosmetics. The antibacterial properties of propolis, the healing qualities of honey and the healing effect of the bee venom are widely known. A new discovery in beekeeping is sleeping on the hives. This type of sleep has a healing effect. An unusual procedure allows relaxing the body during sleep, relieving fatigue and tension, improving health. Treatment of sleep over the bee hives represents a rest on a special rug, under which the hives of bees are placed. A person falls asleep, breathing healthy air, radiating from the hives. The design of the beach bed protects from bee stings, without disturbing daily life of insects. Vibration caused by the bees flying leads to ionization of the air, which has a positive effect on the human body. The vibrations spread by insects, provide a light massage of the body. You should not cover the bed by mattress during sleep on hives, because it will cancel the vibration, and the curative effect will be lost (you may use pillows under your head). Aromas of flowers nectar brought by bees, the smell of honey and propolis create a relaxed atmosphere and positively influence the process of falling asleep. The aura of bee families has a beneficial effect on the human body. Healing sleeping on the bee hives should last at least 60 minutes, if man won’t wake up after hours of sleep, no need to wake him up. You need to take a course of 10 treatments for positive effects on the whole body. It is recommended the use of other bee products for two weeks before therapy to enhance the effect. Don’t worry about convenience and comfort. Hard surface does not prevent the relaxation and the rapid falling asleep. Individual intolerance of bee products, mental disorder, allergy to the bites, exacerbation of chronic diseases. Therapy is not recommended to persons under the influence of alcohol and after taking medicines. Double bed with pillow upstairs. Heat and therapeutic aromas come through the holes in the wall. Two hives with bees in the lower compartment. Sleep on the beehives has a beneficial effect on the heart and blood vessels. It helps to normalize blood pressure, to eliminate violations of circulation of blood, eliminates congestion and edema. It has a therapeutic effect on the respiratory tract. Cleans the bronchi, relieves spasms and facilitates the withdrawal of sputum. It reduces the probability of tuberculous disease. It restores and speeds up metabolism. Sleep on the beehives allows to cleanse the body of toxins, normalizes metabolism, eliminates excess weight and tendency to overeat. It has a positive effect on the reproductive system, eases worries caused by problems with the genitourinary system. Sleep on bee bad slows the aging process. Bee treatment serves as a measure of prevention from age-related diseases of the musculoskeletal and cardiovascular systems. Sleep on the beehives restores vitality by removing fatigue. It leads to normal functioning of the nervous system by removing the effects of stress and tension. The buzzing of bees puts into a meditative state, facilitating the transition from wakefulness to sleep. It strengthens the immune system and treat viral diseases. Scientists have proved the sterility of the hives, backed by propolis. Sleep on bee bad eliminates the symptoms of upper respiratory tract infections, disinfect the body and stimulates the production of immune system cells. It helps to restore the body after surgery, complex acting. Sleep on the beehives reduces the risk of cancer. It should be recalled that healing sleep is a preventive procedure and is no a substitute for treatment prescribed by your doctor. It accelerates metabolic processes in the cells, relieves symptoms, but to eliminate the causes of the disease complex therapy is needed. House for sleep on the hive is made of natural wood and has two versions: outdoor lounger and a covered structure. Approximately 10 hives is required for the manufacture of protected from the weather events house. The house is built of natural wood, without the use of varnishes and paints with hazardous fumes. Hives are built into the base of the structure, bee entrance are directed outward. The roofs of bee houses are covered with protective mesh on top of the boards built a bench to sleep on the hives in order to prevent the ingress of bees inside the house. Between the boards are left cracks through which will flow air saturated with ions. The roof is covered with tiles to protect from rain, are insulated and cut through large panoramic windows. Construction protects people from bees, providing curative sleep and allows a person to be in the room, filled with salutary air. Outdoor lounger is simple to manufacture. 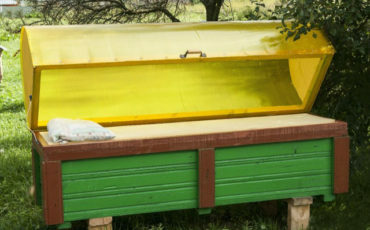 This would require 3-4 of the (bee) hive, over which is stretched the safety net, and installed horizontal lounger, equipped with a lid. Its benefit is in direct contact with fresh air, no need to get distracted by opening the windows for ventilation. The downside of sleeping on the hives in structures of this type is unpleasant sensations when using in bad weather. It is possible to carry out the procedure from the first month of spring until beginning of autumn. It is necessary to divide the dwellings of the bees with the help of special planks at the equipment of a place for sleep on the hives with the bees. Planks will prevent the ingress of insects into the wrong nest. For this purpose hives painted in colors that are recognized by insects. Sleep on the beehives with bees has a powerful healing effect on the human body. After the first session disappears stress and fatigue, normalizes emotional state. There has been a improving the quality of sleep, disappears insomnia and headaches. With the increase in the number of sessions decreases irritability, strengthens the immune system and the nervous system, disappear the symptoms of colds, clears the lungs. Sleep in the beehives has a preventive effect, preventing the development of complex diseases. It is essential for people engaged in heavy physical labor or undergoing surgery. Correctly manufactured houses do not disturb the habitual way of life of bees and protect people from insect bites.